When designing my castle,I wanted to design a simple typical original castle that featured everything you'd imagine a castle to look like, such as spires. I wanted to make the castle mold one solid shape rather than individual pieces that fitted together to make it easier for the someone to use. 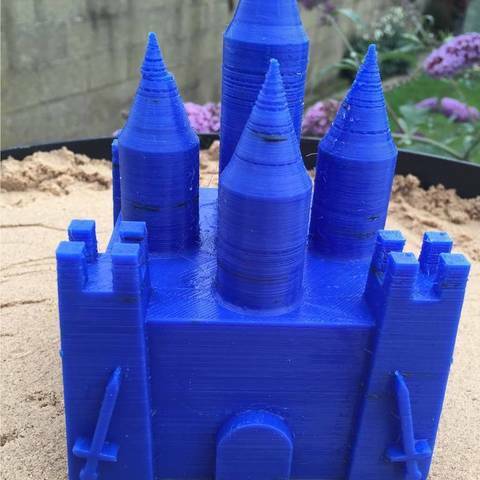 My main goal was to make sure that the sand castle mould carried out its main purpose of actually working by making a sand castle when I removed the mould. By making the mould how I have done, allows you to add the sand to mould ,and then remove the mould and a sand castle to be standing in all one piece. I added some small support rods in the inside of the mould, so there doesn't need to be any support material added when printing , the support rods can be snapped off the mould after its finished printing . I made the mould symmetric, so that printing it and designing it would be easy to accomplish. I made some parts of the design tapered, so that the mould can be released from the sand more easily. The maths that where involved in making this where the height and width of the castle mould. The width had to be wide enough, so that it could support the height of the mould. The wider the base of the mould the taller the mould could be. After carrying varies tests on the mould I found that the base could be 1/3 of height mould without out it falling over. When printing the it I used a 1.5 mm wall thickness, so that all of the detail could be achieved.Setting your 3D printer speed to 50 mm per second should work well. Designed on CAD and 3D printed.